~~ADDITIONAL EQUIPMENT ?? ?foul weather cockpit cover OPTIONAL EQUIPMENT ?? ?ss gas tank ?? ?custom mats ?? ?SS bucket seats ?? ?two pack paint ?? ?Electric kill switch ?? ?Electronic Ignition ?? ?ss battery tray and strap ?? ?screw on oil filter adapter ?? ?Lawrence-tune valve cover ?? ?foul weather cockpit cover ?? ?custom SS aluminum radiator ?? ?72 spoke stainless wire wheels ?? ?ss Aeroquip brake and gas lines ?? ?Lawrence-tune intake manifold ?? ?SS brass header tank and fittings ?? ?ss bonnet latches and bonnet prop ?? ?all stainless fittings where applicable ?? ?42 DCOE Webbers with overhead linkage ?? ?marine plywood and paint used for floor boards ?? ?moto lito wood steering wheel to include original brooklands NOTE: SS denotes SUPERSPORT /ss denotes stainless steel Just sitting in this fine automobile makes you feel like you're a part of history. But to actually own and drive it gives you the feeling that you've actually gone back in time. Whether it be from the sleek, highly polished black finish, or the very classy genuine alligator trunk bag (has a small separation) and custom leather bonnet belt, or the powerful John Sheally built TR4a engine, the pleasure one achieves from driving this vehicle is indescribable. And while each of these components complements each other in such a way as to enhance the driving experience and pleasure, the attention it receives from those who simply stand in its presence is awe inspiring as well. As you can see, the Equipment on this automobile seems endless. The paint job was obviously done by someone who took a great deal of time and pleasure and pride in his work because it still looks almost as bright and new as the day it was done. All the chrome and trim is in good condition as well and the red convertible top has never been used. The manual transmission and rear end shift as they should and the chassis and frame are also in very good condition. A new starter was recently installed and the engine starts with little effort and battery cranking power. While pictures of an automobile of this high quality may be impressive, they can't come close to the feeling one has to see this truly classic vehicle up close and in person. But please note, this is not a factory SS; there were only 110 of those produced so they are very rare and much more expensive than the car being sold here. HISTORY and COMMENTS from the PRIOR OWNER A six year restoration was completed on this car in 1996. The car was taken to the National Morgan meet in Malvern Pa. in 1995 as a rolling chassis, sans all wings. It was reviewed by Mr. Peter Morgan. His suggestion was to bring it up to SS spec. At this meet it won Judges Choice and went on in 96 and 97 to take "Best of Show" at the MCDC meets, and "Best of Class" at the 2003 and 2004 shows. It was also a featured car on "Car & Driver" TV. No expense was spared during restoration. Improvements made, met the criteria of both the MCDC & Morgan factory. In fact, Morgan would have included these improvements, but the price would have been prohibitive i.e. ; Stainless fasteners, muffler, gas tank, etc. While no longer a trailer queen, it is in excellent condition (strong 2+) with less than 3M on the John Sheally built TR 4a engine. The following new factory items were added: cuprinaled tub, frame (color sanded) red Connelly leather interior, wiring harness, rear springs, bulkhead, master cylinder, Lucas flamethrower and fog lights, SS alum. bonnet, factory hood and side curtains. FRAME, FENDER WELLS ETC. LOOK AS GOOD AS THE BODY!!! ~~Morgan automobiles are handmade custom vehicles built at the Morgan Motor Company in Worcestershire, England. The lightweight aluminum body, wood frame, and finely tuned engine provides crisp handling in a design reminiscent of the great fully fendered sports cars of the 1930's. 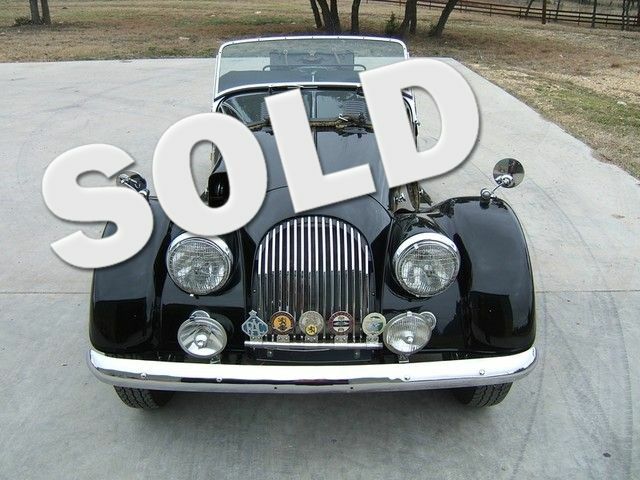 As the result of a conversation between the previous owner and Mr. Peter Morgan, and after inspection, Mr. Morgan was so impressed with the car he suggested bringing it up to SS specifications. The previous owner then after many months of restoration and thousands of dollars did just that. You can see by all the items added to this car why it now has the SS flavor. The Morgan production facility in England even supplied a new frame with the original Morgan vehicle ID stamped into it there at the facility.